Having failed to repeal Obamacare, conservatives, including Sens. 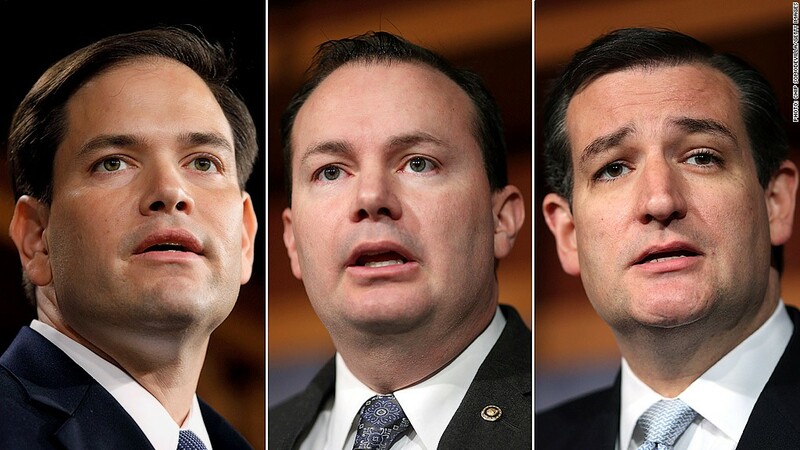 Marco Rubio, Mike Lee and Ted Cruz, want to block federal funding from being used to carry out the law. Doing so could create legal quandaries. Hardline Republicans are threatening a federal government shutdown on Oct. 1 if Congress doesn't defund Obamacare. Conservatives have tried repeatedly and unsuccessfully to repeal the Affordable Care Act, so now they're pushing to disable it by cutting off funding. Politically, it's not likely that they'll be able to gin up enough votes to pull it off. But if they did, the effect of defunding the ACA wouldn't be as simple as it sounds. What does it mean to defund Obamacare? Sen. Ted Cruz of Texas, 29 other senators and more than 100 House Republicans back legislation that would prohibit federal funds from being made available to "carry out any provisions" of the ACA. That would mean no health insurance subsidies for low- and middle-income families and no federal payments to states that have agreed to expand their Medicaid programs. The bill would also cancel any unspent balances of money already appropriated for ACA purposes. The idea is that the defunding measure would be attached to a temporary spending bill, which Congress must pass to avoid a shutdown on Oct. 1, the start of fiscal year 2014. So how is defunding different than repeal? Repealing the law would render all of Obamacare null and void. Defunding it would only make it harder to implement and enforce. But ACA provisions would still be the law -- and that's where things get tricky. For instance, insurers technically would still be obligated to follow all the new regulations. So they'd be required to insure those with pre-existing conditions and would be prohibited from setting any dollar limits on annual and lifetime coverage. But without federal funding for the ACA, that might curb how many Americans sign up for insurance -- especially young, healthy customers -- making it harder for insurers to offset the cost of those new requirements. "It could throw the insurance market into chaos," said Joshua Gordon, policy director at the Concord Coalition, a deficit watchdog group. Of course, since agencies that regulate insurers would not have funding to enforce those regulations, it's possible insurers might opt to ignore the new requirements. How does defunding affect the IRS' ability to collect taxes provided for under Obamacare? There are many tax provisions in the ACA that are projected to raise roughly $1 trillion over the next decade. There's a Medicare surtax for high-earners, for example, and a new tax on makers of medical devices. The intent of the defunding bill is to prohibit the IRS from using any funding to collect or enforce taxes owed under the ACA, according to spokesmen with Cruz's office. So, effectively, no one can be held liable for not paying those taxes, they said. But the tax provisions would still be the law. And that means individuals and companies would still legally owe them. "Laws on the books are legally binding," said David Gamage, a law professor at UC Berkeley. But he noted that "compliance would almost certainly go down. How much is a big question." Wouldn't defunding the health reform law save the government money? It's not clear, since the ACA has a lot of interconnected provisions. The ACA law as written requires a lot of money to be shelled out over the next 10 years -- $1.4 trillion. But it also raises tax revenue and the hope is that it will help cut health care costs. The CBO has not analyzed the net effect of defunding. How likely are conservatives to succeed in defunding Obamacare? Not very. A defunding bill is unlikely to pass a Democratic-controlled Senate or get the signature of President Obama. What's more, plenty of House and Senate Republicans -- themselves no fans of Obamacare -- have pointed this out and publicly criticized their conservative colleagues' approach. Rep. Robert Pittenger of North Carolina told CNN's Jim Acosta that it's a strategy "doomed to failure."